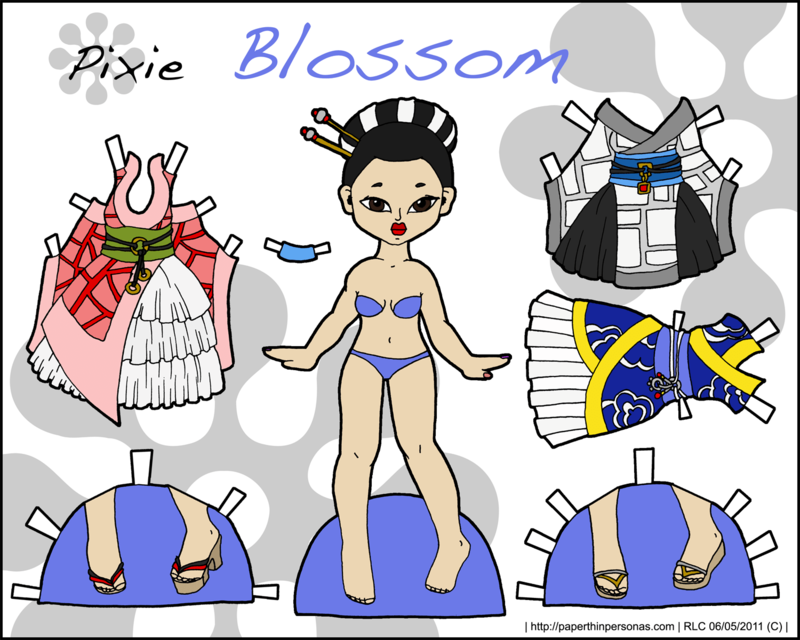 Blossom is not named after the show from the 80’s, though after I mentioned what I was going to call the paper doll my friend commented about that and I almost renamed her. I can’t really say why I named her Blossom, except that she looked like a Blossom to me. I suppose that answer will have to do. Her costumes were inspired by anime costumes, more then anything else. Several of my good friends are heavily into anime, though I openly confess to not being much of a fan. I do like the outfits though. I have been thinking a lot about process lately and about ways to make this blog about more then just the paper dolls I post every few days, so I thought I would also scan the thumbnail doodles that became these costumes. As you might notice, there are some differences between the finished product and the draft. That’s fairly common for me. I tend to change things as I am working on them. My only frustrating with this paper doll was the color schemes for the dresses. I went through several dozen and I am still not sure I like all of them. Maybe I’ll published a black and white version as well… Something to think about. Also, I am very excited to present two paper dolls today. 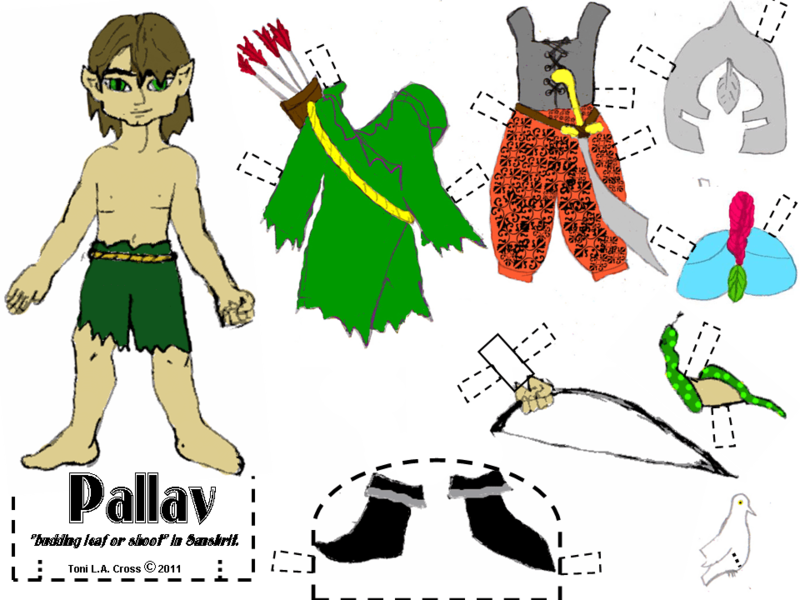 Along with Blossom, there is a version of the Puck paper doll done by Toni L.A. Cross, www.thinkinlikegavroche.wordpress.com, with a much different chin and a quirky expression. He’s an elf and his name is Pavell which is apparently Sanskrit and I think he’s wonderful and very inspired. I especially like what was done with his hand, so he could hold the bow. I want to thank Toni for kindly letting me share him with all of you. It was really fun for me to see what someone else had done based on my work and quite flattering. Thank you, Sara. I’m glad you like her. Thank you for letting me post him. He’s quite fun.